Visionary architect, designer, theoretician, pedagogue, painter and sculptor. Born 12.04.1922 in Helsinki, died 11.05.2005 in Warsaw. Many of Hansen's works were influenced by cubism, such as Stadium I. His work with Jeanneret and contact with Le Corbusier gave him the ability to operate forms in nature. He also became friends with Jerzy Sołtan, who strongly influenced Hansen's vision of "human-scale" architecture. His Paris experience was the starting point in his evolution toward Open Form, the idea permeating all of his subsequent work - a theory embracing art-as-process, engaging the viewer, recipient and user. Oskar Nikolai Hansen's mother was Russian, his father was a Norwegian with distant Polish roots and his grandfather was the famous Norwegian millionaire and philanthropist Herman "Appelsin" Hansen. In 1923 he settled with his family in Vilnius, and was granted Polish citizenship three years later. He studied mechanics at the Graduate School of Technology in Vilnius, graduating in 1942. During the Second World War, Hansen was an active member of the underground Polish Home Army (AK). He moved back to Poland in 1945 and started studying at Warsaw University's Faculty of Architecture in Lublin under Professor Romuald Gutt. Between 1948 and 1950 he lived in Paris on a French government scholarship, where he was an apprentice in the studios of Fernand Leger and Pierre Jeanneret, cousin of Le Corbusier. He also spent some time in London, studying at the International Summer School of Architecture. While in Paris he met a number of outstanding artists, including Pablo Picasso, to whom he was introduced by Zofia Syrkusowa. "Picasso taught me much more about space-time than Le Corbusier did", he confessed years later. In 1949 he took part in the CIAM congress in Bergamo, where he drew attention by criticising Le Corbusier, with youthful passion. After winning first prize in a competition run by the Summer School of Architecture to create a housing estate, he was introduced to Henry Moore. Moore's sculptures integrating the "inside" with the "outside" were of great interest to Hansen, who saw in them elements of Open Form. After completing the London course he was offered a job with Ernest Nathan Rogers at the Royal Institute of British Architects, but turned it down, feeling that it was his duty to go back to Poland to join in the post-war reconstruction effort. Upon returning home, Hansen continued his studies at the Warsaw University of Technology, earning a degree under Romuald Gutt. 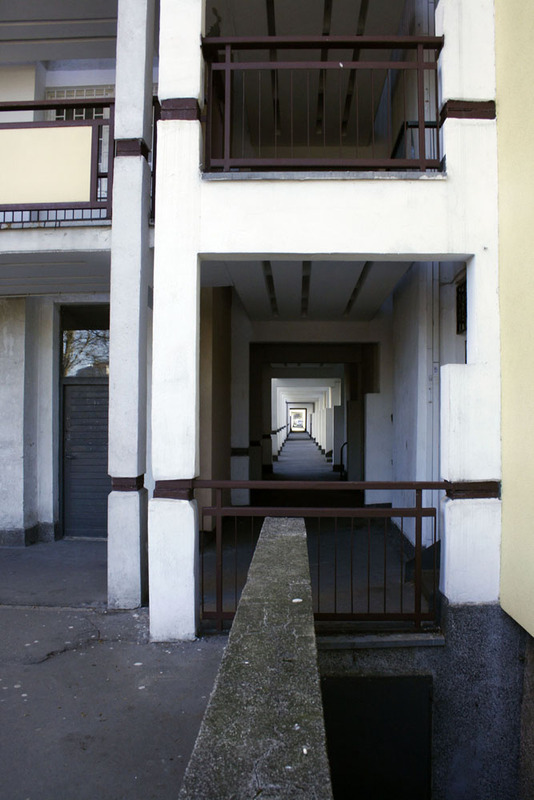 During his third year of studies he was commissioned to design the Dębiec housing estate near Poznań, but his ideas were never realized due to the uncompromising doctrinal framework of socialist realism. One of these ideas – an interior design project for a temporary Warsaw city hall, drawn up in collaboration with Lechosław Rosiński-- nearly got him banned from architecture after Warsaw's chief architect, Józef Sigalin, saw the plans. Sigalin organised a "trial" of the two designers, and Hansen was only saved by a recommendation from Szymon Syrkus; in the end, the whole affair resulted in nothing more than an official reprimand. Following this incident, Hansen took refuge in his studio. He painted and conducted studies of spatial forms, ranging from a "direction study" in 1950 (an unpreserved series of paintings exploring the image as a means of influence) to his "active negative" of 1957. He also accepted government commissions to design pavilions for international fairs. Along with his design work he was also a teacher, and he was affiliated nearly his entire life with the Warsaw Academy of Fine Arts (ASP) where he began working in 1950. From 1952 he created his own curriculum as part of the Solids and Planes Studio (initially at the Faculty of Interior Design under Jerzy Sołtan), and from 1955 he did the same at the Faculty of Sculpture. In 1981 he took over the Interdepartmental Faculty of Integrated Fine Arts at the Warsaw ASP, and two years later he retired. Hansen was a member of the Groupe d'Etude d'Architecture Mobile (GEAM), and in 1958 he received an award from the publication Przegląd Kulturalny for his achievements in the field of fine arts. based on a hyperbolic paraboloid-shaped module, unfolding in space, which allowed for the open, constant forming of a roof of an extremely lightweight construction and a logical, mathematical rhythm of changing forms. ... framing and highlighting the viewers. The composition of that space-time consisted in framing the events – framing together the interpenetrating influence fields of the paintings' static forms and juxtaposing the sculptural forms with the diverse, moving forms of the viewers. The significance of this exhibition was that it demonstrated a novel method of arranging artworks in space, something that would later become known as environment art. In 1957 Hansen, together with Jan Meissner, designed the interiors of the Redoubt Galleries of the National Theatre in Warsaw as part of his contribution to the 2nd National Exhibition of Interiors; he would later declare this work to be environment art. He created a spatial composition using tapestries, painted fabrics, pieces of furniture, ceramics, glass and a beam running across the length of the space. Another similar piece was the result of Hansen's collaboration with Wojciech Fangor and Stanisław Zamecznik, shown in 1958 at the 2nd National Exhibition of Modern Art at the Zachęta gallery. It was a continuous composition of colourful, profiled slabs suspended in the air, connecting the "inside" and the "outside" of Zachęta and ending on one of the top-floor galleries. It was meant to serve as a visual background for the viewers. Between 1958 and 1966, Hansen was employed at the Warszawska Spółdzielnia Mieszkaniowa housing cooperative. He prepared a number of project as part of a team, including: The Road, an entry for an International Exhibition at the Auschwitz-Birkenau Museum in 1958; a design for expanding the Zachęta building (with Lech Tomaszewski and Stanisław Zamecznik); and a design for a museum of modern art in the city of Skopje (in what was then Yugoslavia), which took the form of a number of pavilions with roofs that folded like umbrellas. The Road memorial was created in 1957. The design team, led by Hansen, was made up of Zofia Hansen, Jerzy Jarnuszkiewicz, Edmund Kupiecki, Julian Pałka and Lechosław Rosiński. The radically innovative concept lay in negating the traditional notion of the monument, and instead treating the entire site of the former death camp as a monument in itself. Its central element was a black paved road about one kilometre long and 70 metres wide, cutting diagonally across the camp and petrifying everything in its path. All other remaining relics on both sides of the road – the barracks, the chimneys, the barbed wire fences, the railway ramp and the crematoriums – would be left to be consumed by the effects of time and entropy. The process occurring off the road would play the role of a biological clock. Trees grew there; we saw roe deer and bucks passing through. We wanted to preserve the elements on the road, preserving this all-too-human experience for others, just like the lava preserved Pompeii. 'The Road' monument is a search for continuity. It starts with life, passes through death, and then returns to another life. Life and death define one other within it. It was not a closed-form monument but rather an open-form structure, using space and time as its key elements. The project was favored by the competition jury, however, it ultimately failed to win the support of the community of Auschwitz survivors. A compromise was offered, combining The Road with an Italian proposal; but Hansen withdrew his entry, considering it impossible to combine it with the figurative, sculptural design of the Italians. The idea to which Hansen devoted his entire career was the concept of Open Form. He formulated the theory in 1959 and presented it at the CIAM congress in Otterlo, where it was enthusiastically received by young architects who went on to establish Team X and the Groupe d'Etude d'Architecture Mobile. In the 1960s Hansen also developed the theory of the Linear Continuous System (LSC), transposing Open Form onto the scale of urban planning. Hansen called Open Form a philosophy, a position that defined one's attitude toward reality. The concept, which referred to the theory of sculpture and architecture put forward by Katarzyna Kobro and Władysław Strzemiński, could be construed sociologically as a structure of space shaped by various types of human activities. Hansen always stressed the humanistic element in architecture, never the technological angle. He wrote, "Open Form is about variable compositions – the processes of life highlighted by backgrounds." The artistic convention of Open Form consists of shaping the cognitive space, which is construed as a background highlighting the ever-changing events in the life of nature and of man. The idea is to harmoniously integrate Earth's biological life forms with the space of human activity. Respecting the recipient's individuality, Open Space art creates a spatial atmosphere conducive to reflection, thus opposing the art of a dominant object in space – the cult of dogmatic dictates. With Open Form, Hansen encompassed the idea of environment art using the average man as its driving force. In his designs of housing estates, he treated each individual's activities in his own apartment as a spatial form, and outside of the apartment that form would become one of the elements in a visual polemic with other similar forms – all the results of human activity. The architect's or artist's role should be an auxiliary one, highlighting human activities in a process of change and transformation based on the different forms' legibility. Open Form, as Hansen described it, proposed parting ways with the model of the all-knowing expert; instead, it relied on the capacity of individuals, their mutual relations and the art of events. Open Form, Hansen believed, could become the "realism of our time", the artist's role being to avert chaos while still respecting the "otherness" of each individual. In order for the human activities of Open Form to be clear and communicative, Hansen emphasised the creative role of the individual as the co-author of space. In 1966 Hansen came forward with the concept of the Linear Continuous System (LSC), a new mode of organising human life through urban and spatial planning. It was a utopian idea, envisaging the development of a system of great cities stretching longitudinally across Poland in four parallel 'belts". Their residential zones would be intersected by service, industry and nature zones, thus eliminating the division between the centre and the periphery. This linear system of urban planning stood in opposition to the traditional idea of the centric city. It was realized on a small scale on the Osiedle Słowackiego estate in Lublin (1961) and the Przyczółek Grochowski estate in Warsaw (1963), both designed in collaboration with Zofia Hansen. The relationship between serviced zone (housing) and servicing zones (nature and services) is expressed differently throughout an LSC, but allows for equal ease of access. Hansen educated several generations of Polish sculptors, whom he endowed with the notion of space as a dynamic and socially-conditioned phenomenon. His teachings inspired artists such as Grzegorz Kowalski, Krzysztof M. Bednarski, Zofia Kulik and Przemysław Kwiek, as well as much younger artists who were influenced indirectly, including Katarzyna Kozyra, Paweł Althamer and Artur Żmijewski. Along with the Warsaw Academy of Fine Arts, students can acquaint themselves with Hansen's Open Form theory at Norway's Bergen School of Architecture, which was founded in 1986 by Hansen's disciple, Svein Hatløy. Constructed in several stages by all of its users, the house by the River Bug is the most important spatial manifesto of Open Form — the idea that Oskar Hansen made a nucleus of his architectural work. Since 2014, the house has been under the care of Museum of Modern Art in Warsaw. 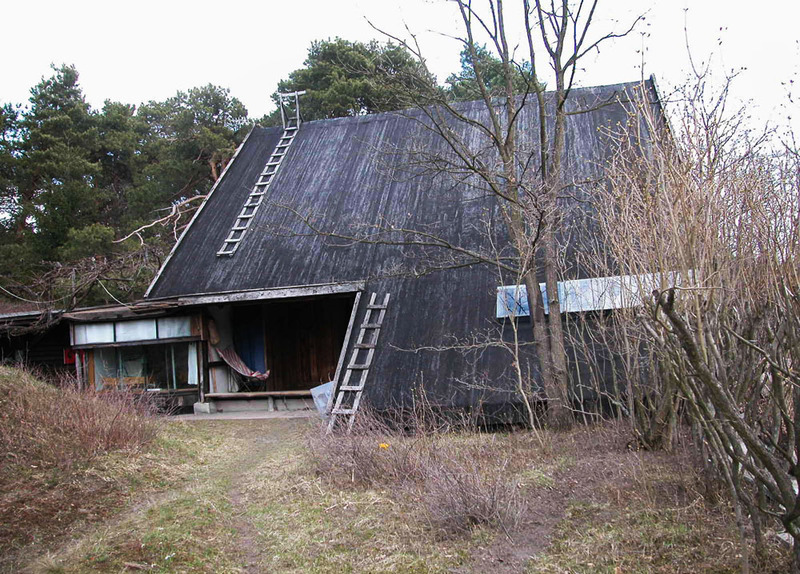 The house in Szumin, Zofia and Oskar Hansen’s work, is the only Polish building on the Iconic Houses Network list. Over 100 buildings all over the world belong to the prestigious network, many of them designed by the most eminent architects, including Antonio Gaudi, Frank Lloyd Wright, Adolf Loos, and Mies van der Rohe. At first, when Hansens bought the parcel, they built a wall in it. It was their first gesture in that space. Later on, they constructed a house which stands on three rows of poles — it’s a wooden construction that doesn’t touch the wall at all. The architecture of Hansen’s house in Szumin smoothly conjoins the interior and the exterior. ‘The way it’s built makes us feel as if it had no walls at all’, adds Kędziorek. The particular atmosphere is created by the traces of passions and actions of its inhabitants — didactic instruments for students scattered all over, and the steel construction from the 1977 Venice Biennale, which was used as the foundation of a wooden house for pigeons. House in Szumin is one of the few buildings of Hansens realised fully in accordance to their wishes and without limitations imposed by the Socialist building industry. Author: Ewa Gorządek, May 2006.